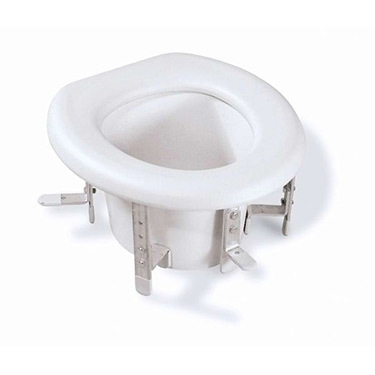 STANDARD RAISED TOILET SEAT is a plastic seat that fits securely and features vinyl-covered brackets that allows height adjustments from 4 3/4" to 6 3/4" above standard seat. Plastic splash guard makes clean up easy. Almond color. 250-lb. weight capacity. Limited lifetime manufacturers warranty on frame. Six month manufacturers warranty on handles, wearable parts, grips, screws. Not suitable for elongated toilets. Due to hygienic reasons, this item is not returnable once the inner packaging is opened. Due to hygienic reasons, this item is not returnable once the inner packaging is opened. A very good product and customer service person. The toilet riser is easy to install, it just fits over the top of the porcelain bowel. It doesn't come with instructions, just the riser. I talked to a very helpful customer service women who obtained the instruction. I knew how the product was installed, the product was delivered within 24 hrs. I would purchase from this co. again. Pros:The great customer service person.